A crew from McMillan Media from the United Kingdom came over to "Nutfield" this week to film scenes for a documentary about the Scots Irish migration to America. They sent Jan Veitch to interview some of the people in Londonderry and Derry who are helping to plan the 300th anniversary celebrations of the arrival of the first settlers to Nutfield. I was included in the interviews and filming, along with Paul Lindemann from the First Parish Meetinghouse, Mark Mastromario and Karen Blandford Anderson of the Derry History Museum, Ann Chiampa from the Londonderry Historical Society, TJ Cullinane did a tour of the Forest Hill Cemetery, Nutfield descendant James Scammon, and the Reverend Doctor Deborah Roof from the First Parish, the current pastor of Rev. James MacGregor's 1719 church. The film crew was originally sent to the United States to capture scenes at the upcoming Ulster Scots Migration conference happening next week August 14 - 16 at Bowdoin College in Brunswick, Maine. They heard about Nutfield via social media and changed their plans to take a side trip here to New Hampshire. Included on their itinerary with the interviews were also plans to film lots of scenery, historic sites, and even do some drone photography. They will also visit Belfast, Maine. I hope to see Jane Veitch next week at the conference, along with other Scots Irish descendants, historians and genealogists, and other researchers of the Ulster migration in 1718. Are you a descendant of a Nutfield Scots Irish Family? Are you interested in attending the 300th celebration? 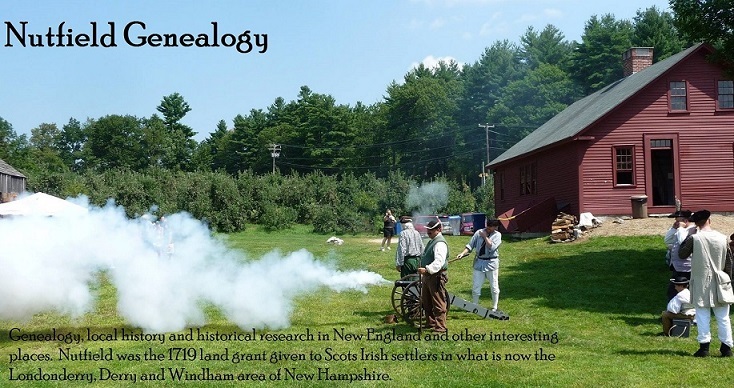 Heather Wilkinson Rojo, "Documentary Filming in Nutfield", Nutfield Genealogy, posted August 10, 2018, ( https://nutfieldgenealogy.blogspot.com/2018/08/documentary-filming-in-nutfield.html: accessed [access date]). Will there be a way to view the finished Nutfield documentary? Descendant of Nutfield settler of 1718, Robert Gilmore. I'll try to post a link to a video version of this documentary when it is available.